When a material is subjected to loading, within the elastic limit, then the ratio of lateral strain to it’s to the Linear(longitudinal) strain is constant. This ratio is called Poisson’s ratio. Consider a rod of length L, Diameter D and two forces acting at the ends of the Rod as shown in the figure. Then there would be deformation in the length and the diameter of the rod. See the Gif image below. The changed Length and diameter would be ΔL and ΔD respectively. 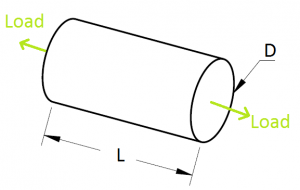 Lateral Strain is the ratio of Change in diameter(ΔD) to its original diameter(D). In Pull type of load, the diameter goes on decreasing, so it will be negative(-ve). Linear(Longitudinal) Strain is the ratio of Change in Length(ΔL) to original length (L). In Pull type of load, the length goes on increasing, so it will be negative(+ve).